Hotline Chronicles: Why must everything be done online? The Norwegian Consumer Council has uncovered serious security and privacy flaws in “smart watches” designed for kids. The Scandinavian organization found that strangers could seize control of the devices, putting the wearers at risk. Tests conducted by the Council and security firm Mnemonic demonstrated how, with a few simple steps, a stranger could take control of the watch and track, eavesdrop on and communicate with the child. To learn more, watch the group’s video and read its report. In October, Consumer Action celebrated its 46 years of outstanding consumer advocacy work during a cocktail awards reception in Washington, DC, honoring Federal Communications Commission (FCC) Commissioner Mignon L. Clyburn, fellow non-profit advocacy group Public Knowledge, and Detroit Public Television for their outstanding commitment to promoting consumer rights. 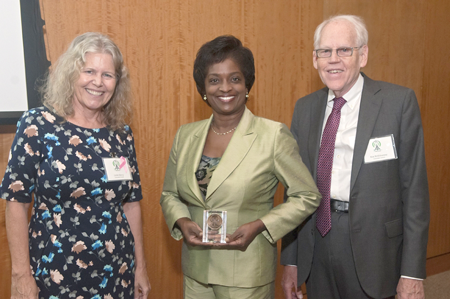 Federal Communications Commission Commissioner Mignon Clyburn (center) accepts her 2017 Consumer Excellence Award from Linda Sherry and Ken McEldowney of Consumer Action. The theme of the anniversary was “Communication: Information, Awareness, Empowerment.” Advocates and allies from the non-profit, corporate and government sectors met at the National Association of Broadcasters (NAB) Hall of Fame. The location complemented Consumer Action’s 46th anniversary theme—the ways in which communication tools and technologies inform, empower and protect consumers. 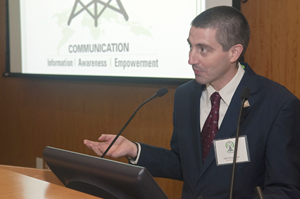 A member of Consumer Action’s event committee, Frank Torres of Microsoft, delivered the first award to Public Knowledge for its work promoting freedom of expression, an open internet and access to affordable communications tools. This year, especially given our theme, Consumer Action wanted to honor Public Knowledge for its work last year as a key ally in the Consumer Video Choice Coalition’s work to “unlock the box.” Because consumers pay $20 billion annually to lease set-top boxes, the coalition pressed to give consumers the power to watch pay-TV with their own devices, which would save money for many families. 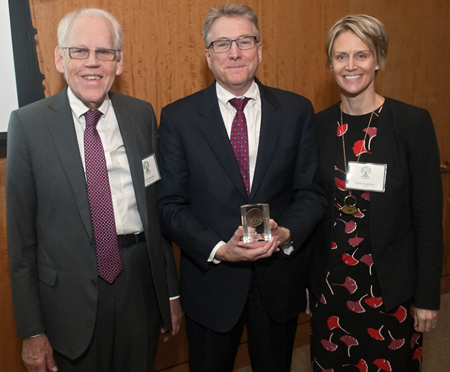 Rich Homberg of Detroit Public Television (center) accepts an award for the documentary "When I'm 65" from Consumer Action's Ken McEldowney and event committee member Susan Diegelman of AT&T. Susan Diegelman of AT&T, also a Consumer Action event committee member, presented the second award to Detroit Public Television for its compelling documentary video, “When I’m 65: Rethinking Retirement in America.” One of the most pressing issues of our times, building a secure retirement is a concern for every American, whether retirement is right around the corner or far off in the future. And educating consumers about income security is an important part of Consumer Action’s mission. The 60-minute documentary uses case studies, engaging animations and lively expert interviews to explore how the financial and lifestyle choices we make today will affect our quality of life in retirement. Rich Homberg, president and CEO of Detroit Public Television, accepted the award. John Bergmayer of Public Knowledge accepts a Consumer Excellence Award on behalf of the digital rights advocacy organization. Consumer Action Director of National Priorities Linda Sherry delivered the final award to FCC Commissioner Clyburn, an outspoken champion of sound regulatory action to protect consumers, close the digital divide and defend the public interest in the technological arena. “Consumer Action has long worked to ensure that telecommunications services remain understandable, accessible and affordable for low- and moderate-income families,” noted Sherry. “So, when we were considering potential honorees who understand the way communication tools and technologies inform, empower and protect consumers, FCC Commissioner Mignon Clyburn was at the top of our list.” After accepting her award, Commissioner Clyburn spoke animatedly about her work to ensure that all consumers have an equal playing field, because despite technological advancements, there is still a lack of diversity and inclusion in the communications sector. The event was underwritten by TracFone, Amazon and the National Association of Broadcasters (NAB). Major donors also included Capital One, DraftKings, Facebook, Microsoft and Verizon. “I’d like to give special thanks to NAB for hosting and to all our underwriters, major donors and contributors for making this another successful fundraiser, ” Ken McEldowney, Consumer Action's executive director, said. Click here for a gallery of photos taken at the event by Stephen Baranovics. Consumer Action Community Outreach Manager Nelson Santiago recently participated in a culture-themed “Family Day” at Cameron House, a faith-based family services organization located in San Francisco. Cameron House has long been a part of Consumer Action’s national network of nearly 7,000 community-based organizations. The agency’s Family Day event provides an opportunity for the Chinese-speaking community served by Cameron House to learn about the cultural and immigrant history of people of various ethnic backgrounds. Consumer Action’s participation in Family Day was a natural fit, since we offer multilingual community education efforts that target low-income consumers, including recent immigrants. Santiago, who is of Mexican descent, shared a bit of his homeland’s festive culture with participants by decorating his exhibit table with Mexican “papel picado” (paper cut-out) banners, two small piñatas, plus tray after tray of sweet, salty and even spicy Mexican candies. On exhibit were many of Consumer Action’s free Chinese, English and Spanish consumer education brochures on topics ranging from money management to banking basics to avoiding scams and identity theft. The event was well represented by a multitude of cultures. Exhibit tables were set up to help attendees learn about African-American, Pilipino-American and Italian-American cultures as well. With the help of Karen Chu, a former Cameron House case manager who was serving as a volunteer interpreter for the event, Santiago described how his consumer education work at Consumer Action is particularly gratifying because of his family's immigrant heritage. "I like that Consumer Action’s materials target not only English-speaking consumers, but also consumers whose primary language might be Spanish, Chinese, Korean or Vietnamese," said Santiago. He added that we have published materials in as many as nine languages! "Another great thing about Consumer Action," noted Santiago, "is that it cares about helping immigrants avoid the types of scams that so often target them." Santiago commended Cameron House for going to great lengths to ensure that Chinese-speaking participants understood everything that was shared by the different presenters, both on stage and at their exhibit tables. Each presenter was assigned an interpreter throughout the half-day event. "Karen was so attentive in her role," Santiago said about the interpreter who worked with him. "I think she's just about ready to put on her own Mexican culture workshop," he joked. Ming Chang, a case manager at Cameron House, expressed her gratitude for Consumer Action's participation. "Consumer Action's commitment to the wellbeing of low-income and immigrant populations is why we’re proud to call ourselves a long-time partner," she said, adding that she was grateful for the information—and the treats—that Santiago shared at Family Day. Consumer Action recently heard from Juanita* from San Bernardino County in Southern California, who wanted to learn how she could complain to the powers that be about “paperless” billing and smartphone apps. Last year, the county created an app (Ready SB) to help residents protect themselves before, during and after a disaster. Juanita said her telephone company, Frontier Communications, also imposed a “paper statement fee” each month for those who wanted paper bills, which Frontier had stopped providing to those who established online accounts (unless they specifically requested them, in which case the account holders were charged the fee). We advised Juanita to write to her state assemblyperson and senator, as well as the San Bernardino County supervisor responsible for her district. We have learned that San Bernardino County has emergency alert options for people who do not have the internet or smartphones. Tracey Martinez, public information officer at the San Bernardino County Fire Department, told Consumer Action that the county calls landline phones and broadcasts emergency signals on radio and TV if a serious emergency, such as a wildfire, threatens residents. Martinez added that they have paper-based brochures containing safety information that can be sent upon request. She suggested that no matter where people live, they contact their local fire department or office of emergency services to learn more about emergency notification options. We also told Juanita about how she can take action by sharing her story with the Coalition for Paper Options. Consumer Action believes that giving consumers a choice of free paper-based communications (or providing explicit instructions on how to access emergency information offline) is critically important for millions of Americans—especially for seniors and the more than 30 percent of citizens without online access. Yet the government and private sector have eagerly adopted electronic delivery in order to cut costs. We feel it's crucial to preserve paper-based access to bills, information and services. Opposed a U.S. Securities and Exchange Commission (SEC) proposed regulation (Rule 30e-3) that would eliminate the current default requirement that those who invest in mutual funds are provided with paper shareholder reports and other important information. Hard-copy shareholder reports are a critical and widely read resource for investors, and Consumer Action would like to see that paper is the default vehicle for information provided to consumers, who should have the chance to request electronic delivery if they want it. Urged the Internal Revenue Service (IRS) to automatically mail paper tax forms and instructions to the more than 30 million tax filers who filed on paper in the previous tax year. The IRS stopped mailing tax forms and instructions, and taxpayers must now go online to view or order these materials. If you’d like to take action to support these efforts, visit the Paper Options coalition website. In October, Consumer Action’s Audrey Perrott attended the Understanding and Measuring Your Customers’ Financial Well Being webinar hosted by the non-profit Center for Financial Services Innovation (CFSI). An authority on consumer financial health, CFSI has a network of over 100 members committed to “creating the future of financial health.” These members serve 165 million consumers. CFSI defines consumer financial health by eight key metrics, including one’s ability to accumulate savings, earn a prime credit score and consistently pay bills on time. The CFSI webinar outlines a methodology that business can use to understand and measure the financial health of their customers. You can watch the recorded webinar on YouTube. Promoting financial health is good not just for consumers, but for the financial services industry, says CFSI. Financially healthy consumers are more likely to need financial services and engage with companies offering useful financial products and tools. The group notes that financial health also has a positive economic impact on communities at the local and national level. So what is the big deal about financial health? According to CFSI, financial health challenges extend beyond the underserved into mainstream population segments. It found that approximately 57 percent of Americans (or 138 million adults) could be considered financially unhealthy. Not surprisingly, CFSI found a correlation between planning and saving and financial health. The webinar provided an overview of a CFSI analysis that revealed two facts: First, households that plan ahead to make sure they have the money to pay for large irregular expenses are 10 times more likely to be in a healthy segment than those who cannot or do not. Second, those whose primary time frame for saving for the future is five years or longer are eight times more likely to be in a healthy segment than those whose time frame is less than five years. CFSI is aiming to help financial services companies be part of the solution to addressing individuals’ financial health challenges. Wells Fargo has some (more) explaining to do. As Wells Fargo’s widespread deceptive business practices continue to come to light—including a recent revelation that the bank likely withheld information related to an estimated 800,000 cases of fraudulent auto insurance sales practices during its last congressional hearing—advocacy groups are urging the Senate Banking and House Financial Services committees to hold additional hearings regarding the bank’s fraudulent activity. Learn more. FHFA can and should do more for low-income communities. Advocates recently submitted comments to the Federal Housing Finance Agency (FHFA) lauding its efforts to improve strategies that ensure that those from low-income communities have better access to affordable housing and homeownership, while also noting that more can be done to help this population. Learn more. FDA must take steps to rein in prescription costs. In a letter to the Food and Drug Administration (FDA), advocates called on FDA Commissioner Gottlieb to end regulatory abuses by brand-name companies that block access to generic drugs. These drug companies twist the FDA's rules to delay or inhibit consumer access to generics, which gives the companies the power to charge unreasonable prices and leads to greater healthcare costs. Learn more. Secretary DeVos called on to protect student loan borrowers of color. Consumer Action joined the Leadership Conference on Civil and Human Rights, a coalition of more than 200 national advocacy organizations, in sending a letter to U.S. Secretary of Education Betsy DeVos. The letter expressed strong concerns about the Department of Education’s recent changes to student loan servicing, debt collection and higher education regulations and their impact on Black and Latino borrowers. These actions are inconsistent with the Department of Education’s responsibility to advance higher education and serve the interests of all students, including students of color. Learn more. ED urged to put students’ interests first as it reconsiders critical regulations. Consumer Action joined veteran, student, civil rights and college advocates in submitting public comments to U.S. Education Secretary Betsy DeVos urging the Department of Education (ED) to place the interests of students first as it explores potential changes to student lending regulations. The comments specifically urge the Department to reverse course and enforce, rather than roll back, existing regulatory protections for students and taxpayers. Learn more. Advocates call on Congress to do more for victims of Equifax breach. The Equifax data breach is prompting calls to Congress for better protection of consumers' sensitive financial information. Not only should free credit freeze legislation be implemented immediately, but Congress should also resist the financial and banking industries’ attempts to pass legislation that preempts stronger state laws in matters that relate to consumers’ data security and privacy. Learn more. Fed up with servicing problems, student loan borrowers often turn to the Consumer Financial Protection Bureau (CFPB) for help. Student loan complaints filed with the CFPB have led to $750 million in relief for borrowers, according to a new Bureau report. More than 22,000 borrowers submitted student loan complaints in the last year alone. Complaints are filed against student loan servicers and lenders, debt collectors and debt “relief” companies. The CFPB says that borrowers’ complaints have resulted in interest rate reductions for servicemembers, better protections regarding federal loan repayment relief and an end to automatic defaults on some private student loans. “As borrowers continue to fall through the cracks of our broken student loan system, the Bureau’s work to date offers a roadmap for consumer-driven reforms,” said CFPB Student Loan Ombudsman Seth Frotman. Access to income-driven repayment plans: After receiving complaints about processing delays and affordable repayment plan denials, the CFPB cited student loan servicers for illegally denying borrowers’ income-driven repayment options. The U.S. Department of Education also required servicers to send timely information to borrowers about how to apply for income-based repayments. Overdue interest rate reductions for military student loan borrowers: More than 100,000 servicemember borrowers have saved an estimated $20 million in the last year since receiving the automatic interest rate reductions they’re entitled to when on active duty (under the Servicemembers Civil Relief Act). The U.S. Department of Justice and the Federal Deposit Insurance Corporation relied on consumers’ CFPB complaints to sue lenders over these violations. Elimination of automatic private loan defaults: Responsible private student loan borrowers were being placed in default and ordered to repay their loans immediately and in full when a co-signer died or declared bankruptcy. When loan contracts were unclear, CFPB examiners halted the use of automatic defaults. At least six private lenders have since deleted damaging automatic default language from their contracts. The CFPB sued two companies that posed as federal government affiliates and promised to eliminate consumers’ debts for thousands of dollars in upfront fees. The Bureau’s lawsuit against Federal Debt Assistance Association, LLC and Financial Document Assistance Administration, Inc., both operating under the name “FDAA,” alleges that the companies falsely promised consumers debt relief and improved credit scores. According to the CFPB, FDAA claimed it could do so by disputing consumer debts and eliminating them if the lender failed to respond to the company. Misleading consumers about a federal government affiliation to lure them in. The CFPB says its lawsuit is intended to stop FDAA’s deceptive practices against financially vulnerable consumers and to return the fees that consumers paid. The CFPB has released another financial resource, this one designed to assist and empower people with disabilities. The guide emphasizes the principle that everyone has the right to control their own money, and complements the Bureau’s financial empowerment guide Your Money, Your Goals. Identify financial exploitation and abuse. The CFPB also offers companion guides that focus on Native communities and on those re-entering the population after being incarcerated. Links to all of the guides can be found here. Class action settlements involving Terminix and Collecto were among eight new settlements added to Consumer Action’s Class Action Database in October. Of note this month is the class action settlement Hirsch v. Citibank, N.A. Two Citibank customers filed a class action against Citibank alleging that the bank failed to adequately disclose that it would report the promotional American Airlines (“AA”) miles it offered to entice consumers to open accounts as income to the IRS (leading customers to have to pay taxes on those miles). Citibank issued Internal Revenue Service (IRS) Form 1099s that valued the AA miles at 2.5 cents per mile. Plaintiffs claimed that AA miles are not, however, reportable income and that Citibank overvalued the miles for reporting purposes. Citibank denied the allegations but agreed to a settlement to avoid the burden, expense and risk of continuing the lawsuit. The settlement provides a $1.75 million settlement fund. The payment amount per class member is calculated by multiplying up to 70 percent of the amount of airline miles “income” reported on the class member’s 1099 by their federal tax rate. This payment amount may be reduced if the overall claims amount exceeds the settlement fund of $1.75 million. You are part of the class if, between Jan. 1, 2009 and July 13, 2017, you received IRS Form 1099 from Citibank as a result of receiving AA miles in connection to opening a Citibank deposit account. The claims deadline is Nov. 27, 2017.